The Mango tree, Mangifera indica L., produces the most economically important fruit crop in the Anacardiaceae (Cashew or poison ivy family). Other important members of this family include cashew, pistachio, and the mombins (Spondias spp.). The family contains 73 genera and about 600-700 species, distinguished by their resinous bark and caustic oils in leaves, bark, and fruits. There are two classes of cultivars: Indochinese and West Indian. The Indochinese group is characterized by flattened, kidney-shaped, somewhat elongated fruit with light green or yellow skin, and little or no red blush color (on left in photo). West Indian cultivars are more rounded and plump, and generally have a bright red blush to the skin (on right in photo). Many of the so-called “Florida cultivars” are West Indian types selected or bred in Florida, such as ‘Haden’, ‘Tommy Atkins’, ‘Kent’, and ‘Keitt’. The cultivated mango is probably a natural hybrid between M. indica and M. sylvatica that occurred in southeastern Asia to India. Selection of wild types has occurred for 4000-6000 yr, and vegetative propagation for at least 400 yr in India. Mangos were brought to England and Europe after the English occupied India in 1800’s. They were brought to Brazil and the West Indies in the 1700’s with exploration of the area, and to Florida in the late 1800’s. Portuguese and Spanish traders took mangos from India to East Africa, the Philippines, and western Mexico. From western Mexico, mangos were taken to Hawaii in the early 1800s. Florida production grew through the early 1900’s in southern Florida, but urbanization, freezes and hurricanes reduced production from 7000 acres to 2500 acres. In 1992, hurricane Andrew reduced the Florida acreage to 1000-1500, where it remains today. Despite the small scale of the Florida industry, it has been extremely valuable to mango cultivation worldwide due to the research and cultivar development carried out through the 1900s. World (2004 FAO) – 27,043,155 MT or 60 billion pounds. Mangos are produced in 90 countries worldwide on 9.4 million acres. Worldwide, yields average about 6400 lbs/acre. United States (2002 USDA) – 2500 MT or 5.5 million lbs. All production is in Florida and Hawaii on a total of about 1600 acres. Prices received differ greatly: Florida – 26 ¢/lb, Hawaii – 92 ¢/lb. Yields are poor relative to other areas of the world, only 1400 lbs/acre in Hawaii and just under 4000 lbs/acre in Florida. 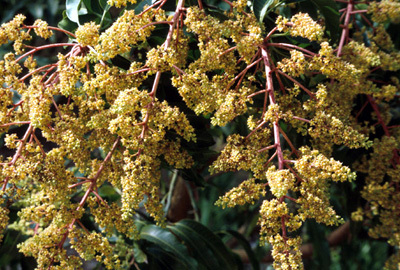 The Mango is a large, long-lived tree with a broad, rounded canopy, generally 20-100 ft tall. Cultivated orchards are kept at 20-30 ft. Leaves are lanceolate to linear, (4-16″ long × 1-2″ wide), dark green, with prominent light colored veins and entire margins. Emerging leaves on new growth flushes are bronze-red initially, and appear wilted. One or two growth flushes occur per year, with flushes placed sporadically across the canopy of a given tree. Leaves may persist several years. 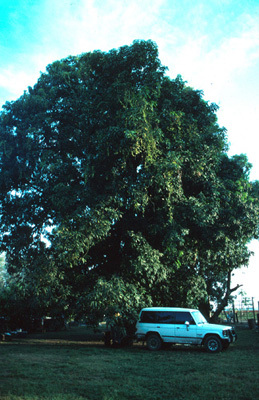 A large mango tree on a farm in southern Guatemala. 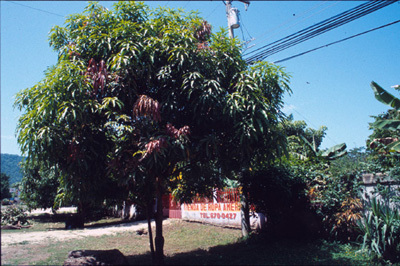 A mango tree along the roadside; note the purple coloration of the new flushes, which are scattered across the canopy. Tiny (1/8-1/4″), red-yellow flowers are borne in large, terminal panicles of up to 4000 individuals. About 25-98% of the flowers are male, depending on cultivar, and the remaining hermaphroditic. Panicles are initiated in terminal buds 1-3 months prior to flowering, triggered by low temperatures or seasonally dry conditions. Mango flowers are produced terminally in panicles. Individual flowers are tiny, yellow, and mostly staminate. Mangos are considered self-fertile and do not require pollinizers, but research indicates that some cultivars are self-unfruitful or at least benefit from cross-pollination. Fruit set is generally just a few percent, with an average of only one mango borne per panicle. Pollination is achieved by wild insects, and to a lesser extent, honey bees. Mangos are large drupes. The large, flattened, kidney-shaped central stone contains one or more large, starchy embryos, and can constitute up to 20% of fruit weight. The skin has yellow or green background color, with red/orange blush in many cultivars, and is thicker than usual for drupaceous fruit. The skin contains irritating oils, particularly in unripe fruit. The flesh is yellow/orange in color, sometimes astringent and fibrous. Fruit ripens in 80-180 days after bloom. Soils – adequately drained and mildly acidic (pH 6-7). In Florida, trees are grown on limestone gravel (pH 7-8). Climate – seasonally wet/dry climate zones of the lowland tropics, or frost-free subtropical areas; ceases growth at temperatures below 55-60oF (not truly dormant). Leaves and fruit are injured by mild frost (28-32oF). Indochinese cultivars are often polyembryonic, and will produce true to type mango trees from seed. In less-developed countries, seedling trees are grown, which come into bearing later than grafted trees. 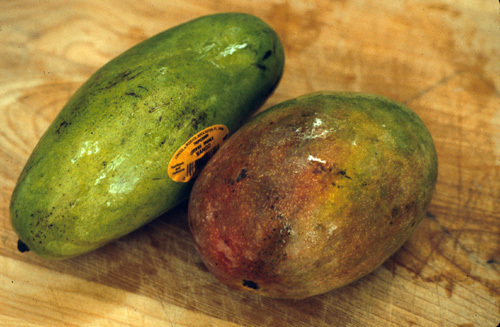 West Indian mangos tend to be monoembryonic, and are mostly grafted on seedling rootstocks. Techniques vary from inarching and approach grafting in India, to or veneer-grafting and chip budding in Florida and the American tropics. Vigorous mango seedlings of various cultivars are used as rootstocks. Polyembryonic cultivars are often preferred since the rootstocks are genetically identical when grown from seed. Planting Design – square or rectangular designs and spaced 30-50 ft apart, yielding 18-35 trees/acre. In Florida, where roots are restricted by rocky soils, mango trees are planted at the intersections of trenches in limestone @ 20-30 ft apart (up to 100 trees/acre). 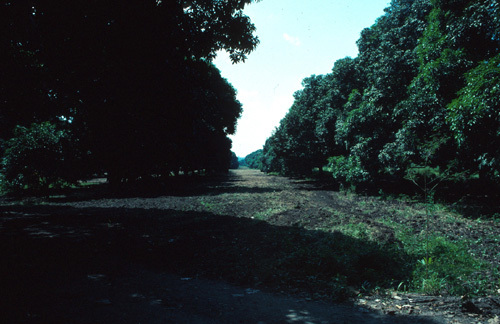 Trees in alternate rows can be removed from higher density plantings once crowding occurs. Pruning and Training – very little necessary; in formative years, mango trees may be pruned to have one main trunk clear of branching up to about 3 ft. After that, they assume a desirable rounded canopy shape naturally. Later, trees may be hedged and topped to control size. Color change from green to yellow, and the development of “shoulders” on the stem end of the fruit are the best indicators of maturity. Also, the fruit flesh turns from white to yellow starting at the endocarp and progressing outward to the skin during maturation. Mangos are hand-harvested, simply by snapping-off fruits from peduncles in less-developed plantings, or by clipping peduncles 4 inches above the fruit when intended for export. This allows the milky, toxic latex to ooze from the stem without touching the fruit surface. Stems are trimmed to 1/4″ prior to packing in 14 lb boxes containing 8-20 fruits, depending on size. 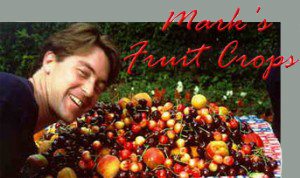 Fruit are culled by hand, removing diseased and off-grade fruit. In countries where fruit flies are endemic, fruit are dipped in hot water for fruit fly quarantine requirements, and anthracnose control. Fruit are stored for 15 days at 70 F and RH of 85-90% for curing postharvest. Mangos are subject to chilling injury, and must not be stored at <55°F. Storage life is only 2-3 weeks under optimal conditions. Mangos are one of the finest fresh fruits in the world, but can be dried, pickled, or cooked as well. Mangos are higher in vitamin C than citrus fruits. Green mangos are the tropical equivalent of green apples – tart, crisp, and somewhat dry, often eaten with salt. They are cooked or used in salads in the tropics. About 25% of mangos are processed into juices, chutneys, sauces, or dried. The large seed can be processed into a flour, and the fat it contains can be extracted and substituted for cocoa butter. Per capita consumption of mango is 2.1 lbs/year.